Here's Fisher,(Jaycox #81), with Canadian competitor Mark Sammut, (Sammut #78) on the outside. 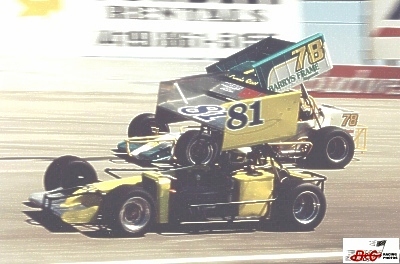 Sandusky, Ohio's Jack Smith in the Stout #83. Here's Jack's Stout teammate, Pat Shullick in the #49. Pat was fast all day and led a good portion of the feature. New Hampshire's Joe Petro (Petro #99) dives into turn 3 with PA's Lou Cicconi, Jr., (Cicconi #75), close behind. The always sharp looking car of Essex, MA veteran, Howie Lane.